Theory of Change is a rigorous yet participatory process whereby groups and stakeholders identify the conditions they believe have to unfold for their long-term goals to be met. These conditions are modeled as outcomes or, more precisely, desired outcomes, arranged graphically in a causal framework. The framework provides a working model against which to test hypotheses and assumptions about what actions will best bring about the outcomes in the model. A Theory of Change provides a clear and testable hypothesis about how change will occur and what it will look like. The theory describes the types of interventions (a single program or a comprehensive community initiative) needed to bring about the outcomes depicted in the causal pathway map. Each outcome in the causal pathway is tied to an intervention, revealing the often complex web of activity needed to bring about change. As a roadmap, a Theory of Change identifies measurable indicators of success and keeps the process of implementation and evaluation transparent, so everyone knows what is happening and why. ActKnowledge uses Theory of Change as a foundation for strategic planning, credible and relevant evaluation, instilling ownership of the initiative among all stakeholders, and building organizational capacity. Stakeholders value theories of change as part of program planning and evaluation because they create a commonly understood vision of the long-term goals, how they will be reached, and what will be used to measure progress along the way. ActKnowledge has trained and facilitated Theory of Change in the United States and the United Kingdom with domestic and international organizations. Continuing the Theory of Change tradition that the Aspen Institute Roundtable on Community Change disseminated, we provide curricula, training, and materials through the theory of Change website, http://theoryofchange.org. Created and maintained by ActKnowledge, this website includes materials and information developed by the Aspen Institute Roundtable on Community Change. The website provides an overview of TOC and its origins and an introduction to our methods for creating a TOC. The site provides information about TOC training and technical assistance and additional materials for experienced users of TOC on advanced topics. 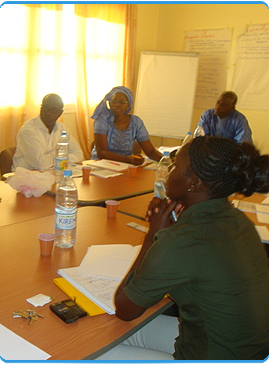 We have provided Theory of Change training, technical assistance, and review to national and international organizations. For specific examples, see Clients and Publications.